Location We are in in the heart of Islington (Caledonian Road), with great transport links to both tube and overground station a few minutes walk away. Plus the added bonus of being situated just a stones throw from Kings Cross station. Description HIHO offers affordable, flexible desk rental. 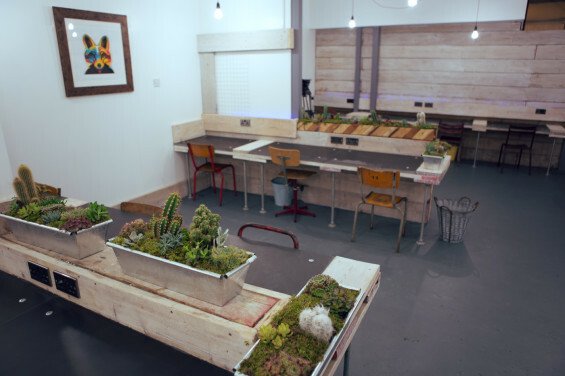 You'll be joining a hub of like-minded creatives in a professional, sociable space. We provide fixed desk rental, so you will have your own desk allocated to you. We are in the ideal location to bring together start-up communities and entrepreneurs and provide an environment for your business to flourish. Our aim is to help creative businesses grow and we offer a wide range of facilities, including the option of bookable meeting room, bookable outdoor workshop, textiles lab, scanner, printer, kitchen and showers to help you feel at home and use the space however suits you.